Ever since I was a kid, I've been fascinated with astronomy. I wanted to be an astronomer when I was young. I didn't understand that other people weren't as fascinated with the books on planets and black holes and such that I regularly checked out from the library. When I was eight years old, I'd heard that a craft had been launched that was going to investigate Jupiter and Saturn. I thought I would die of suspense long before it ever reached Jupiter - how could I possibly wait all those years? And there was an even longer wait for it to get to Saturn, which, clearly, was the coolest planet in the solar system. I mean, RINGS, people. I was also aware that there was a record on that craft, and that the record had music and messages that would hopefully find their way to intelligent, extraterrestrial life. And then, they'd know about us, and come here, and that would be so cool! I had no idea how to find out what was on that record. But truly, what made my young mind reel was the question How did they decide what to put on it? What was on it was important to me, but thinking of the process of creating it was almost overwhelming. How did they do it? There's a LOT of music in the world, and this was the '70s, so I knew how short records were. How did they (whoever "they" were) narrow down the choices, and most importantly, agree on what should be included? The Voyager mission taught us that Saturn may not be the coolest planet, or at least, not because it was the one with rings. We learned that all of the gas giants have rings. Voyager discovered twenty-three new moons. In 1979, Voyager 1 took these photos of Jupiter, and we could finally watch the movement of the Big Red Spot. 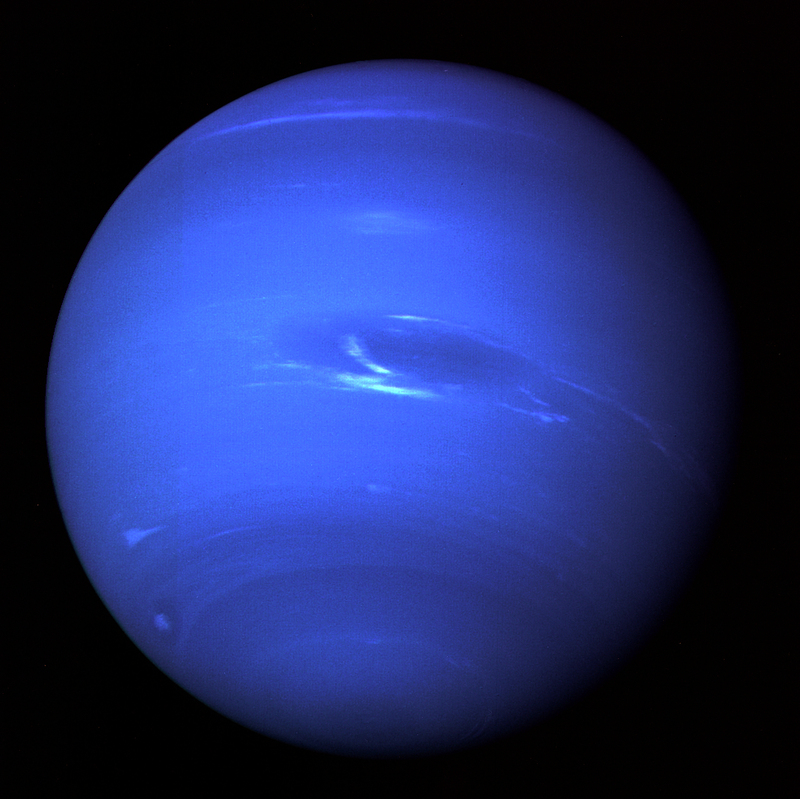 In 1989, Voyager 2 took this photo of Neptune. Gorgeous. 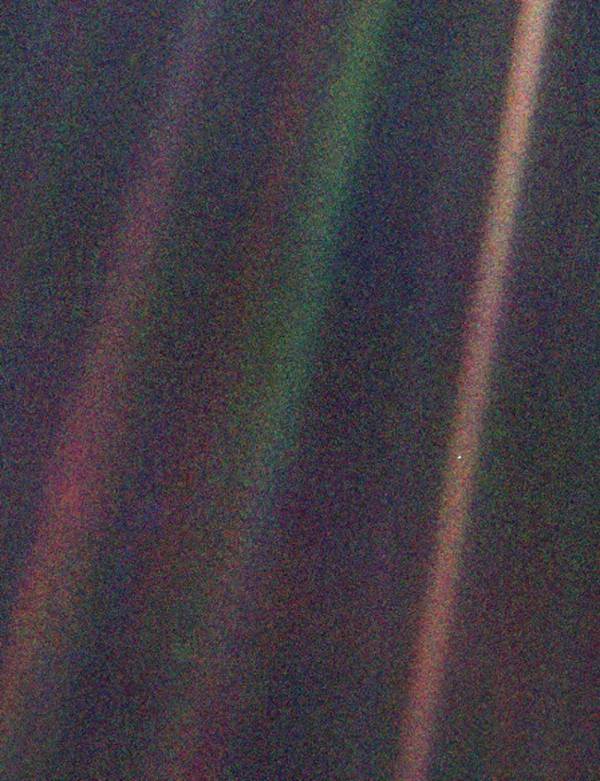 Most breathtaking, for me, is the "Pale Blue Dot" photo taken of Earth from over 4 billion miles away. See it? In the far right "sunbeam," that tiny, 0.12 pixel point of light? That's us. The Pale Blue Dot. There we are. I will probably blog more about the Pale Blue Dot photo at a later date, because it blows my freaking mind. When I learned that NASA has confirmed that Voyager 1 has left the solar system, and Voyager 2 is close (in astronomical terms) behind, I had to learn more about this mission that's captivated my imagination for nearly 40 years. Now we have the internet, and it's easier to sate my need for information about the Voyager mission. I'm still thrilled and overwhelmed. The more I learn, the more I want to know. For instance, check out the ticker on the NASA website, showing how far away the Voyagers are. 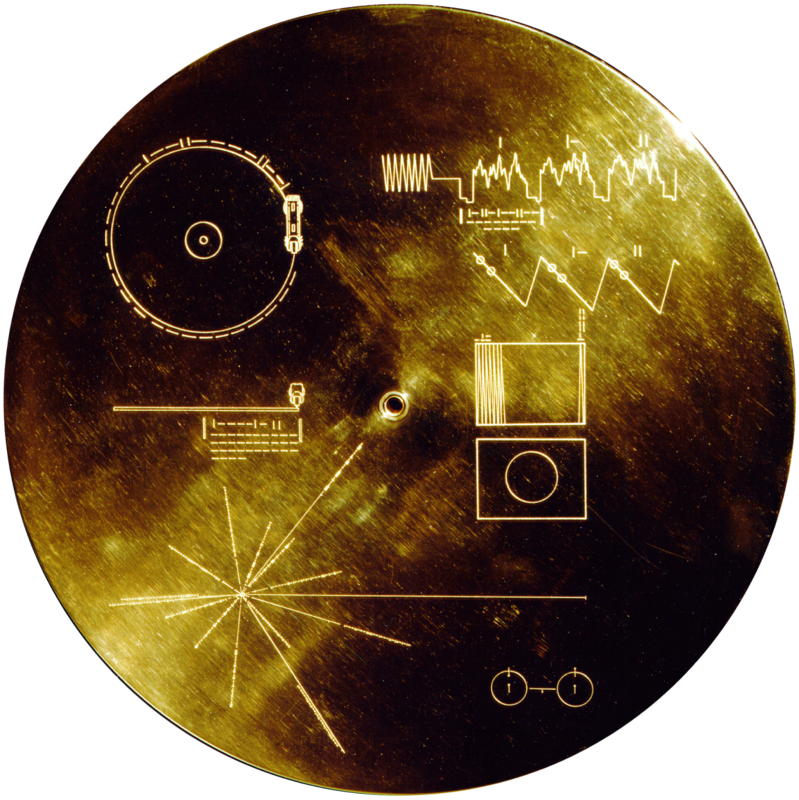 So, we wrote this play, about how the Golden Record was put together. Carl Sagan led the project, and who doesn't love Carl Sagan? Then we found out that the Gottlieb Planetarium at Union Station was excited about having us do it there. How perfect! And then we talked to Billy Blob, a local animator, and he was enthusiastic about contributing fantasy story elements from thousands, or millions, of years in the future. And the cast. The beautiful, slightly off-kilter-in-the-best-ways, asking-the-hard-questions, motley crew of a cast. They're delightful. In the meantime, check out the western sky. Venus and Jupiter are hanging out together. Look at them, and know that Venus is currently about 70 million miles away, and Jupiter is 489 million miles away. The surface area of Jupiter is 120 times bigger than Earth's. I am not able to fully grasp this. My mind just stretches and twists and turns and tries to comprehend that size and distance, but can't. So here's the official blurby stuff about the show. I really hope you can come see it. In 1977, Carl Sagan was asked by NASA to create a peaceful greeting to extraterrestrial life; a Golden Record that would be included on board the Voyager Space Mission. The next six months were filled with frantic calls, governmental red tape, unexpected egos, miscommunication, and last-minute changes, but most of all, the question: "What does it mean to be human?" The creators of the 2014 Kansas City Fringe Festival's Best-Attended Show, “Red Death,” invite you to the magical dome of Union Station's Gottlieb Planetarium, where live actors, animation, and outer space collide in a comedic, informative, and unconventional theatrical event for all ages. "Voyage to Voyager" is co-written by Bryan Colley and Tara Varney, the authors of "Hexing Hitler/Sexing Hitler" and "KHAAAAAN! The Musical." Tara Varney also directs. The play stars Coleman Crenshaw as Carl Sagan, Jen Benkert, Claire Davis, Andy Garrison, Michael Golliher, Parry Luellen, and Shelley Wyche, and features original animation by local artist Billy Blob. Tickets are available at the door, or through the Fringe website. Also, don't forget the one-time purchase of a Fringe button, which you can use over and over to get into other Fringe shows and events, helps sustain the Festival operations, as well as being a nifty status symbol to show off how artsy and cool you are.